Starting roughly in March, tornado season greatly affects the United States with the most active season being from May to June. Even though this is the time when tornadoes frequently emerge, many storms stray from the pattern and they have the ability to happen at anytime, anywhere. Even though the season is about to end, Mooring likes to help everyone prepare for the unexpected. Some wonder, am I at risk? While some cities have had an extensive history of tornado outbreaks, a surprise outbreak startles some states that are generally unfamiliar with these weather conditions. 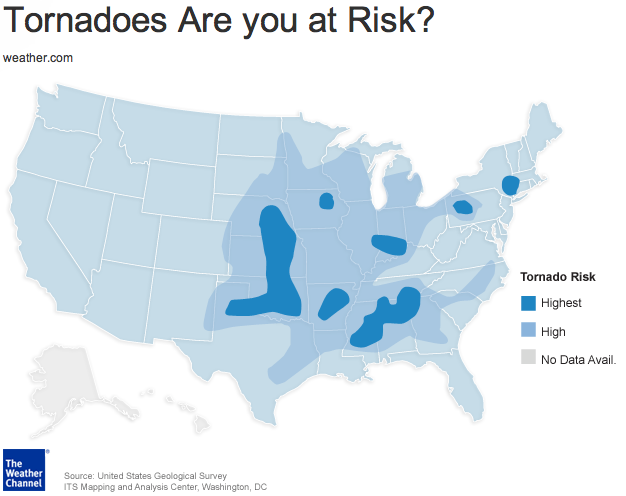 The image below shows each region the risk when it comes to tornadoes. When it comes to watches and warnings it can often be confusing on what each means and how serious each alert is. Severe thunderstorm watches and severe thunderstorms warnings often come prior to tornado watches and tornado warnings. Since severe thunderstorms produce tornadoes and cause damage, they are extremely important to look at as well. Everything must be taken into account to minimize tragedies. Mooring has the ability to assist in any situation due to being highly experienced and mobile. For such situations, Mooring’s catastrophe teams can perform structural repair and emergency services.